This taxon is a localized habitat specialist (EOO 7 km²), known from two locations. Population decline has been observed at one of these locations. 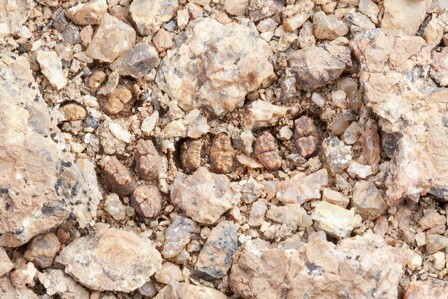 Granite domes, chiefly between eroding plates but also at the edges of shallow sandy pans, 980-1100 m.
The landowner at the type locality has reported catching plant collectors on his property. This taxon is rare in cultivation, and therefore collecting pressure on wild plants is expected. This taxon is known from two subpopulations, each consisting of several hundred to thousands of plants. It is cryptic when out of flower. There has been reports of local declines at the type locality, but the reason for the decline is not certain. Hammer, S. 1988. A remarkable new Conophytum from Bushmanland. Aloe 25(2):34-35.